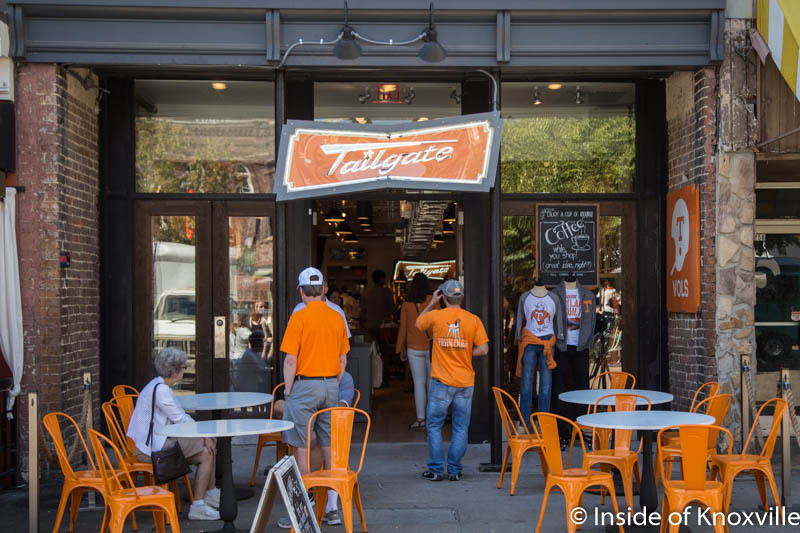 New retailer Tailgate opened at 23 Market Square last Friday morning. 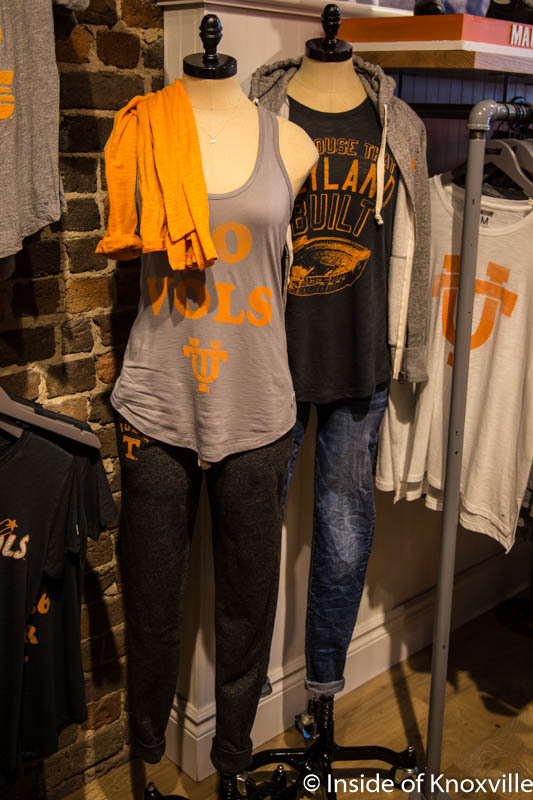 It’s the Vol shop I thought we would have had a long time ago in downtown, but it has a couple of twists I wouldn’t have expected. 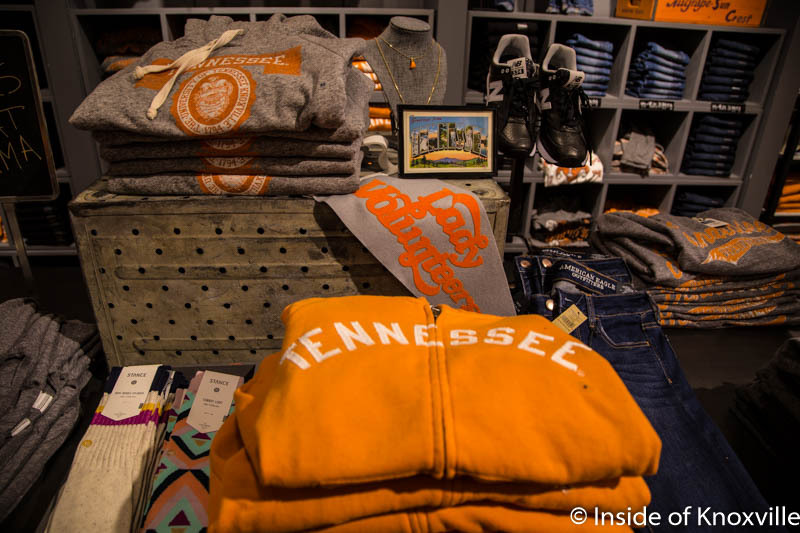 Owned by large retail chain American Eagle, this is only the third opening of this particular concept, with the first two located in college towns outside the south. 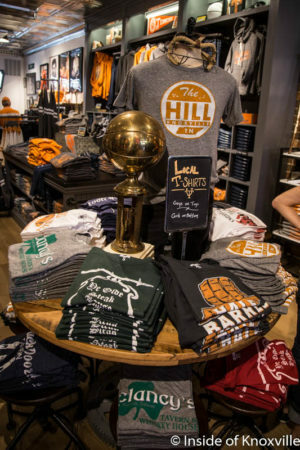 An additional location is planned for Athens, GA.
Offering mostly merchandise with a vintage twist, Eric Ainge has been involved in launching the new store. 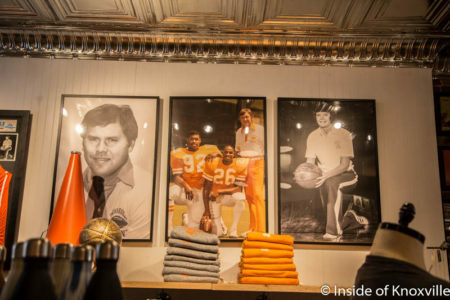 It’s all Vol, but you’ll find little to do with current coaches, while you’ll find older photos of coaches like Phil Fulmer (when he was a very young man), Johnny Majors and Pat Summit. 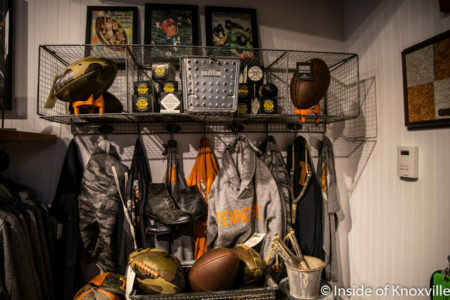 Retro footballs and old locker-room wire baskets display the merchandise. 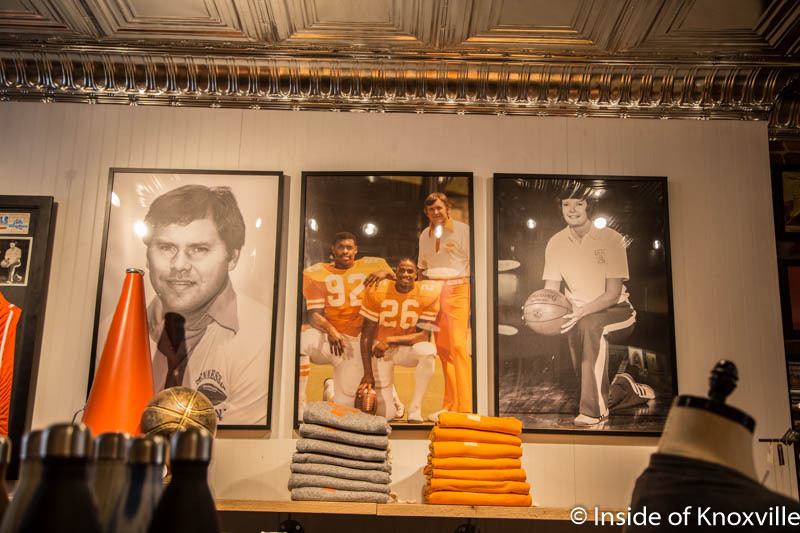 Framed pieces of previous iterations of the checkerboard end zone are available for purchase. Modern apparel is available, from sweat shirts to jerseys, much of it with vintage logos. You’ll also find camouflage apparel, jeans and more. 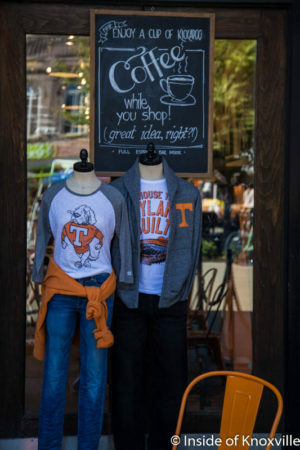 A sign in the middle of the store declares, “Girls in front, Guys in Back.” I assume that means clothing for each of the genders is separated to the front and rear of the space. 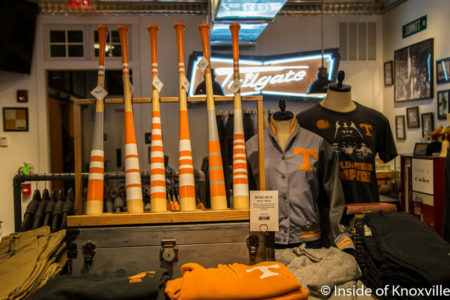 Vol baseball bats, hats cups and drink bottles as well as sports shoes are also scattered about. You’ll also find t-shirts represented other local businesses, such as Clancy’s and Ye Olde Steak House among others. While vintages sportswear is an an angle that isn’t too unexpected, the food offered in the store surprised me. A full coffee bar is situated prominently near the entrance offering all manner of coffee drinks, from your basic through your fancy, using Kickapoo Coffee out of Wisconsin. 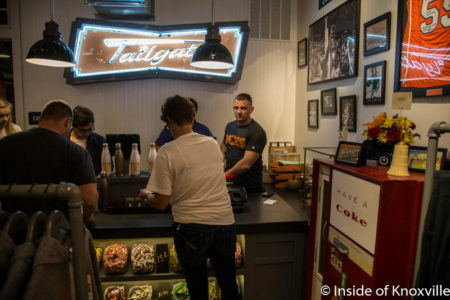 They also offer a variety of other drinks like Italian Soda, Mexican Coke and tea. 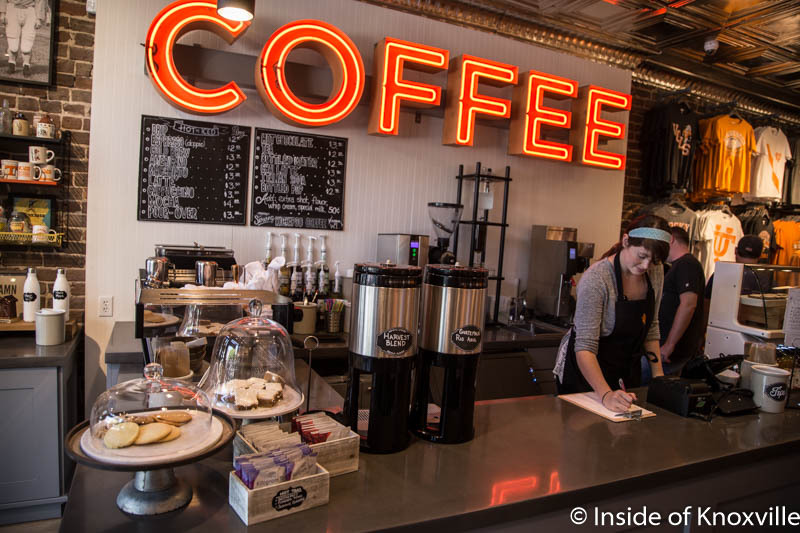 The counter also displayed a range of baked goods. The rear of the store also has a bit of a surprise of the culinary sort: Jars of candy ranging from pieces for 15 cents to packages for $1.50 line the checkout counter to the rear. A vintage coke machine appears to be a functioning element in that part of the store. Tables and chairs sit waiting out front for tired shoppers and people wanting to sit with their drink and food. A number of people used them Saturday to eat their lunch. 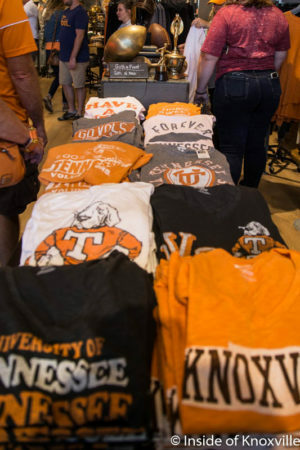 I’m not sure if the orange tables and chairs are for sale, but I’d be surprised if not. 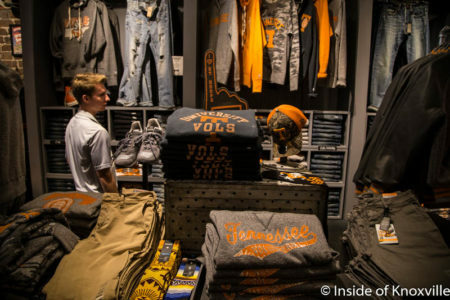 I’m a bit surprised the store didn’t open until mid-way through the football season, and they may have missed the peak level of enthusiasm for this year, but long-term it’s hard to imagine this store not being successful. It was filled when I dropped in on Saturday. 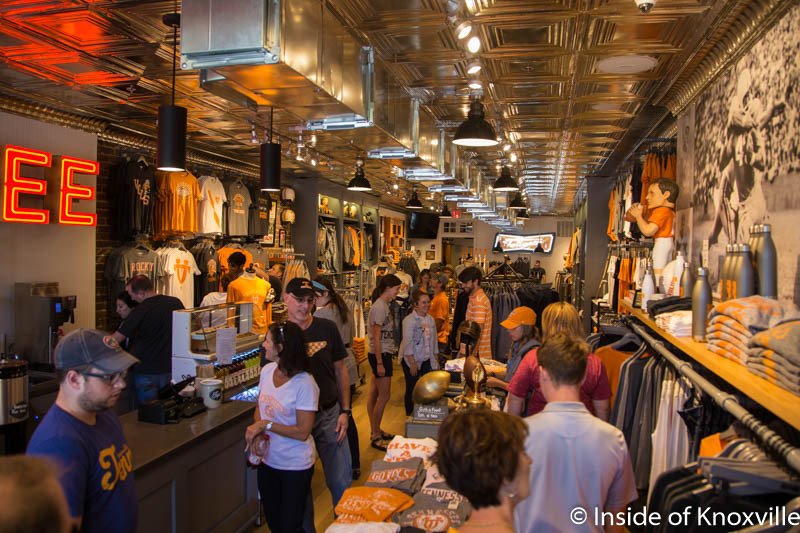 You’ll notice a certain local celebrity in the photos if you look closely. 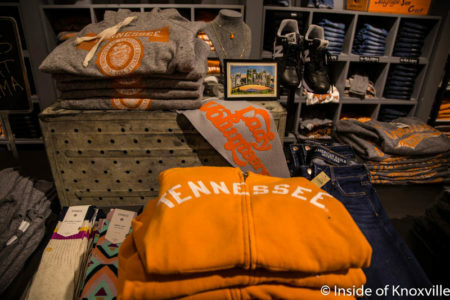 Check them out if you are into the Vol thing. I bet you’ll like what you find. I would like to see them support some of the locally designed and produced apparel such as Patriot Threads – which would be perfect for this location and would sell like hotcakes in Market Square. Great variety, but as expected, everything is a little on the pricey side, unfortunately.